I keep reading about all these lovely plans for fall gardens on other blogs (usually bloggers who live on the east coast). Well, here in California its still not feeling cool enough for it to really be fall. I decided after doing some delicate research in my container balcony garden that it was time for some containers to be turned over and replaced with new “fall gardeny” plants. 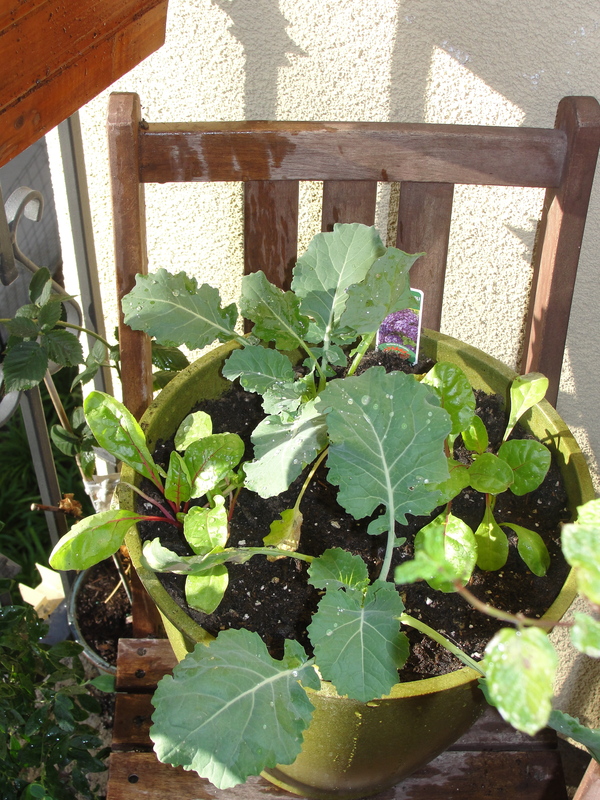 I planted a few pots with purple broccoli and swiss chard I bought from the Farmers Market. 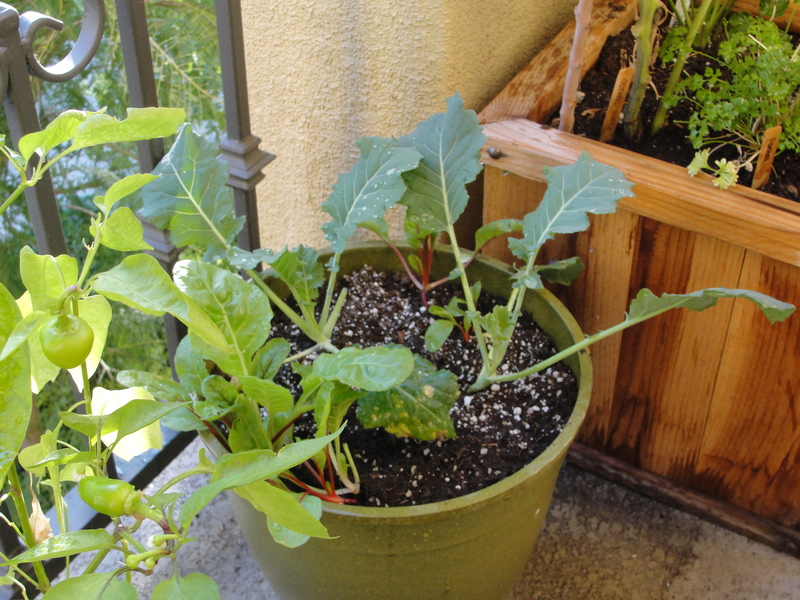 After a brief caterpillar invasion was thwarted by my nimble caterpillar pinching fingers, the broccoli is doing wonderfully and the swiss chard is growing like mad. 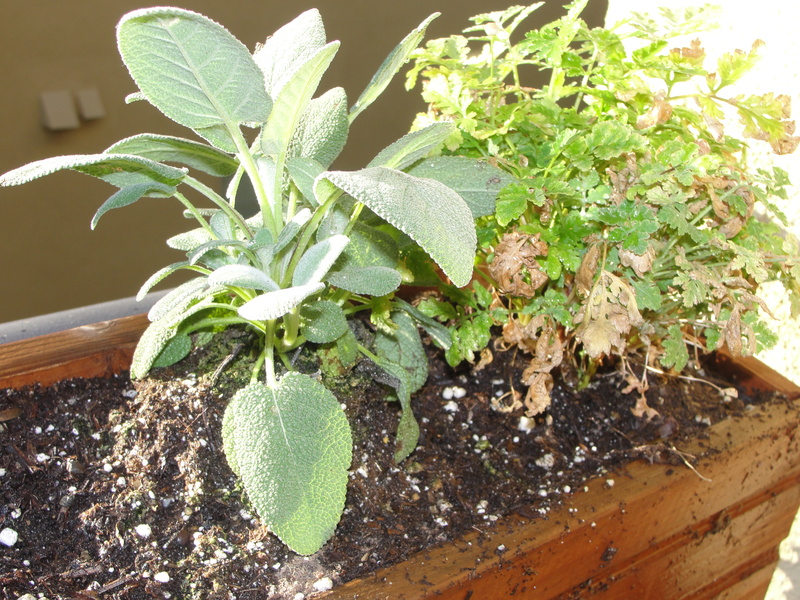 I also worked through one of the window boxes that held strawberry plants and flowers and replaced a dead strawberry plant and flower with sage and feverfew. They seem to be happier in this location. (The feverfew wasn’t doing so well in its previous home as you can tell by its browning. Hopefully that will subside and it will perk up with a little more sun). It’s just the beginning to what I would like to do. I find myself already dreaming up next spring’s garden and the things I will do differently. But, for a person who always killed any plant I touched just a few years ago, I think I am doing pretty well for a new gardener. We had a tiny bounty of tomatoes, basil, peppers, blueberries and cucumbers this year and I am mighty proud of all that I produced! I like the “nimble caterpillar pinching fingers.” You’ve once again inspired me. I’m going to redesign my garden and for the first time grow some winter crops. I’ll keep you posted. so glad I could inspire you! its something new to me to plant during the fall but it has already proved to be a lot of fun!